The IDC has set aside R1-billion from its Gro-E Scheme for business development to launch the Gro-E Youth Fund, which will exclusively support enterprises owned by young people under the age of 35. Sibongile Zondo may not be sure which business sector she wants to venture into, but the 23-year-old from Dube Village, Soweto, certainly has a good idea what is required of a person to set up one. Clutching a paper bag full of brochures and information leaflets, Zondo is one of scores of youth who braved a chilly afternoon on 18 April to witness the signing of the Youth Employment Accord at the Hector Pieterson Museum in Orlando West. On the day, the Industrial Development Corporation (IDC) also announced that it has set aside R1-billion from its Gro-E Scheme to fund businesses owned by young people. “What I really know is that one has to have certain skills to set up a business. There are so many young here in the township who have the capability and the brains but unfortunately they have no means to start one,” said Zondo. A volunteer at Ikageng, a non-governmental organisation, Zondo, like so many young people in the township, says she has been looking for a job since she finished school but to no avail. She has also been sending CVs to various companies without any luck. For young people like Zondo, the Gro-E Youth Fund may come as a boon. Under the scheme, the IDC offers financial support to start-up businesses with the main aim of contributing towards sustainable job creation. The R10 billion Gro-E Scheme was launched in 2011 to facilitate job creation. To date, R3.5-billion has been approved to 114 companies, and is expected to create 23 800 jobs, according to IDC CE Geoffrey Qhena. The IDC has earmarked R1 billion of the remaining R6.5 billion of the Gro-E scheme to businesses owned by young people under the age of 35. The fund provides loans at prime less 3% to businesses that operate in industries falling within IDC’s mandate and are creating new jobs. The funding is available to South African citizens and the minimum amount for finance is R1-million. Qhena says young entrepreneurs play an important role in the economic development of the country. “It is important that we recognise the role that young people play in developing the country’s economy and the fund will go a long way in helping youth grow their businesses. The fund will also contribute in reducing the current levels of unemployment. “This specific fund will support the youth to become part of the solution to curb unemployment. Young people are very enterprising. However, access to funding has been one of the greatest challenges,” says Qhena. The IDC will work very closely with other institutions such as the National Youth Development Agency (NYDA), Small Enterprise Development Agency (SEDA), Small Enterprise Finance Agency (sefa) and sector bodies to ensure that the fund is well marketed, according to Qhena. Direct applications to the IDC can be made at any of its regional offices or the Pre-Investment Business Centre at its Sandton head office. Qhena says there is another easier option for those applying for funding. He says entrepreneurs can make use of IDC’s online application facility, accessible via its website. Abel Malinga, divisional executive divisional executive: mining and manufacturing industries at the IDC, says by establishing the Youth Fund, the IDC is encouraging young people who have brilliant ideas to establish their own businesses. “Youth should be creating businesses to employ other people and move away from the culture of looking for jobs after finishing tertiary. “We know that the main issue affecting most youth setting up businesses is lack of funding. There is also the issue of information. Young people can approach other sector organisations especially to acquire knowledge and skills before approaching us,” he says. Before applying, young people need to get their company registered, put their business idea together then apply. “They should form a close relationship with the NYDA and business incubators,” he adds. 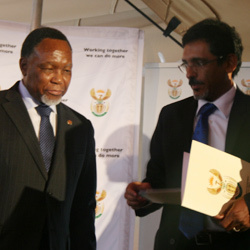 Addressing ministers, representatives of youth organisations, labour unions and business leaders, deputy president Kgalema Motlanthe said the launch of the Youth Employment Accord, is “a historic step in our determination to improve the lives of our people, especially the youth of our country”. “Today we launch the youth employment strategy that commits the major players in the economy and the organisations of young people to a real and concrete partnership. Only collaboration and co-operation between the youth themselves, government, business and labour can address the challenges we face around joblessness. On the one hand, all of these stakeholders have key roles to play in growing employment opportunities,” he said. The Youth Employment Accord has six commitments, namely: education and training; work exposure; strengthening measures that increase the number of young people employed in the public sector; to youth target set-asides in particular industries; youth entrepreneurship and youth co-operatives; and to develop private sector measures to expand the intake of young people, with targeted youth support and incentives approved by all constituencies. The commitments in the accord will be rolled out within these three months. Business organisations have thrown their weight behind the youth employment strategy and have committed to undertake discussions within their structures to identify specific actions that can be taken to improve youth employment and announce these shortly, said Motlanthe. Motlanthe commended the IDC for its R1-billion of its Gro-E funding scheme to make low-interest rate loans available to youth-owned or youth-focussed enterprises over the next three years. “The IDC will also provide technical support to young people to assist in accessing these funds and will refer them to other support available in the state.” Economic development minister Ibrahim Patel said the signing of the accord will “ensure a new generation of young people have skills and decent jobs”. Patel said providing jobs to young people is not an act of charity, but a fundamentally necessary means to create our nation’s economic goals. “This economy needs young people as much as young people need jobs,” he said.